Ohas and his family are so thankful for a waterproof home, made possible by a gift of tin sheets. Ohas had taken on extra work in the coal mines to take care of his family. He had a job in cultivation, but he needed to earn more to buy the tin sheets his bamboo house desperately needed. The hay roof it currently had didn’t protect him and his family. When it rained, the roof leaked. When it was windy, the hay blew away. It seemed Ohas had to repair the roof every year, so he and his wife agreed: They needed sturdy tin sheets to protect their home and their children from further hardships. But working in the coal mines didn’t provide as much as Ohas had hoped. Even with all of his hard labor, the tin sheets were never within reach. One year, during an exceptionally windy season, a storm demolished Ohas’ bamboo house. It was irreparable. He and his wife quickly made a temporary shelter of plastic coverings and prayed God would provide—and He did! 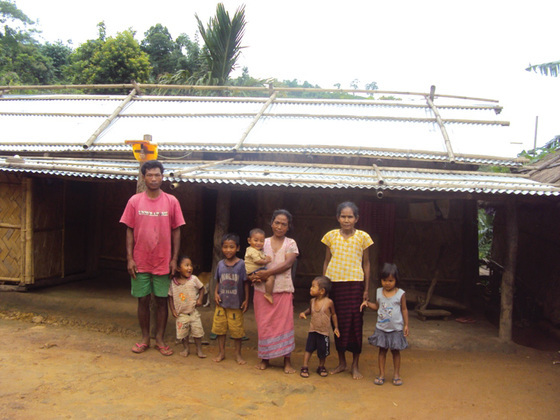 Through donors’ generous giving, a Gospel for Asia-supported pastor was able to provide Ohas’ family with tin sheets to make a beautiful, sturdy home. For the first time in a long time, Ohas, his wife and their children could sleep peacefully, not fearing what any rain or wind could do to their new home.